This is the third article in our series called, Love Selling Your Home: Minimize Your Stress, Maximize Your Profit. It’s a step-by-step guide — from finding a real estate agent and all the way to settlement day. First impressions from the get-go are very important when it comes to selling your home. But you don’t need to spend thousands of dollars to get your home ready. There are many easy and inexpensive ways to make your home look its best and show well to potential buyers. If you plan to move anytime soon or in the next year or so, start to think about what your home needs to make it shine and be more profitable in the long run! Don’t waste money or spend foolishly. Little improvements can add up so come up with a plan before you head out shopping or tackle any projects. Take the time to go through your home to know what rooms need help. That way you’ll get a complete picture of potential projects and expenses. Make sure to consider attractive upgrades or enhancements that have a much bigger bang than their actual buck. That way your initial investment will not only help sell your home but you’ll reap the reward of a better sales price. Know your market and what potential buyers are looking for in a home. Every neighborhood is different so know what features are big selling points. If comparable homes have granite or quartz counters, you may want to consider upgrading if yours is lacking. Don’t think you need to do major renovations, even in the bathroom and kitchen. Focus on basic updates that make your home look clean, stylish and polished. Smaller upgrades can make an impact on your home, and show it’s well-loved and well-maintained. Buyers want to see that. Skip the luxury fixtures or appliances, since there are less expensive ways to make these rooms attractive to buyers. But do stay clear of anything that looks cheap or not well-made. That would be wasted money since buyers will not be impressed and will budget in the cost to upgrade themselves. Buy things you can take with you to your next home. If you buy colorful throw pillows, a new area rug, or a new duvet cover for a bed, try to select items that you can use in your next home. Think strategically every time you make a purchase. Give yourself time to get projects done. Selling a home can be stressful as it is. You don’t need to feel rushed to try and get it all done in a couple of weekends. Start working on your home well before you want to list it. You’ll avoid making rash decisions that could cost you more money. De-clutter everywhere, and we mean everywhere. Pack up many of your items now before you move. It’s such a simple thing to do and can make a big impact when someone walks into your home. Clear those bathroom and kitchen counters, bookcases, closets, pantries, cabinets, etc. Clean your entire home thoroughly. If you can’t do it yourself, then hire a professional cleaning company to come in and really make everything shine. Then maintain that sparkle yourself on a regular basis. Don’t forget to clean your carpets. Paint is a cheap and easy upgrade you can do yourself. A fresh coat can do wonders to a room, especially if you keep it neutral. Don’t have enough money to paint everything? Then just do the trim and ceiling and you’ll be amazed at what a fresh coat of white paint can do for the room for half the cost. Keep your pantry and cabinetry clutter-free. Organized shelves and cabinets make even a small kitchen look like it is functional and has lots of storage space. Definitely don’t stack or store your tableware, pots, and kitchen tools haphazardly! Remove window treatments and screens to let in as much light in as possible. A bright home is a cheerful, welcoming home. You might want to consider a professional window cleaner. Drapes can be so subjective (you either hate or love the fabric or style) so removing them makes buyers focus on the rooms and the light! Don’t forget about lighting. Consider replacing outdated light fixtures or replace the bulbs with the highest wattage to lighten up the rooms. Even getting a new lamp shade can bring a pop of color into your room. Add color, warmth or ambiance. Try new pillows for your couch, colorful placemats in the kitchen, flower arrangements, a shelf and candles in the bathroom, new bathroom rugs, or a floor lamp. Pick a focal point in each room and make it pop, like a bed in the bedroom with updated linens or a plant in the corner of your living room. Look for guidance in design magazines and on Pinterest. If you can’t afford a professional stager or consultant, and desperately need some design guidance then get some magazines or go on Pinterest to see what the average person finds appealing now. A few items placed strategically in your home can make a big impression. Don’t forget to use what you already have if necessary. Maybe something in your bedroom or another room (such as a painting, chair, a cool mirror, etc.) can bring more style to your living room and vice versa. Ask a friend for input and be open to mixing it up! Make extra rooms have a purpose with style. Turn an extra bedroom into a real guest room or a great office space. Show buyers what each room can be used for and stage it with furniture or pare it down if necessary. You want buyers to picture themselves using that room. Showcase any unique spaces or features. Do you have a nook, alcove or area under the stairs? Now is the time to play it up and make it look nice and useful. Create a work station or a quiet reading bench in that space with all the necessary “props.” Think cozy blanket on that bench with a nearby tray for a coffee cup or books. Make your dining room and kitchen tables look polished and pretty. You can set the table with linens and tableware, use colorful placemats, or flowers in a vase. Put some designing touches on all your table spaces (even the one on your patio!). Again, Pinterest is a great source of ideas. Service your kitchen appliances and make sure they are in working order. Do this now so you have the time to repair or replace if necessary. Replace outdated appliances with mid-range products that don’t break the bank. Buy less expensive but reliable and attractive looking appliances. Similarly, if there are any appliances that you lack, which most buyers consider essential, it makes sense to buy one (like a dishwasher—you can get a nice model for under $1,000). Don’t replace your cabinetry entirely—even if it’s a little outdated since it’s just too subjective. You might think sleek, white Scandinavian cabinets are the way to go, but you’ll be in a bind if your potential buyer prefers dark wood. Make sure they’re clean and polished though. Invest in refacing (not replacing) your cabinets if they are extremely outdated. Many refacing companies will give your cabinets a fresh façade for well under $2,000, and it’s a good investment in creating a polished feel for your home. Get new hardware for cabinets if you don’t reface. That will give them a more updated look and feel for much less. You could even consider a new backsplash to add some pizazz. Don’t go crazy getting a new expensive countertop. There are so many different counter options these days that it’s impossible to find one that will please most people. If you do need to replace, find a good deal on one of the more popular options in your neighborhood right now so that it’s comparable to other homes. Clean and refinish stained or dirty grout to avoid any yuck reactions. Hire a professional if needed, it will be worth the cost. Reglaze old tubs or sinks to make them sparkle. This can also cover up that outdated green or pink color! It’s better to create a more pleasing neutral bathroom if you can. Your home will appear more “move-in ready” and that’s what many buyers look for today. Replace outdated or small shower fixtures. If you have a 30-year-old, tiny showerhead, replacing it with a large, rainwater-style model will lend a subtle spa-like quality without costing a lot. Again, new sink faucets and hardware can make a difference. Don’t feel like you should replace your vanity but consider painting or refacing cabinets. Plus adding some new hardware can update its look too. If it’s extremely small vanity and your budget allows it, buy an inexpensive but attractive one at Home Depot or Lowes. Freshen up the vanity areas in bathrooms with inexpensive fixtures. Go with a bigger mirror and better lighting to create a cleaner, updated look. Use Pinterest for some easy design ideas. Look for a bright color rug, consider a floating shelves, put in scented diffusers, hang new towels (that you can take with you to your new home too!). As you can see, you can find easy and inexpensive ways to make your home look its best. Sometimes you’ll need to spend a little bit more money but the investment should be worth it. Now that your home is all ready for buyers, it’s time to price it! 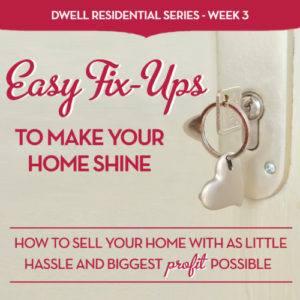 Next week in our Love Selling Your Home series, we’ll show you how to price your home so you’ll get the right foot traffic your home deserves. Don’t miss “The Price Is Right” Gets Your Home Sold.